, try these exercises while you're working at your desk, sitting at the dinner table or walking around. : Americans tend to scrunch their shoulders forward, so our arms are in front of our bodies. That's not how people in indigenous cultures carry their arms, Gokhale says. To fix that, gently pull your shoulders up, push them back and then let them drop — like a shoulder roll. Now your arms should dangle by your side, with your thumbs pointing out. "This is the way all your ancestors parked their shoulders," she says. "This is the natural architecture for our species." 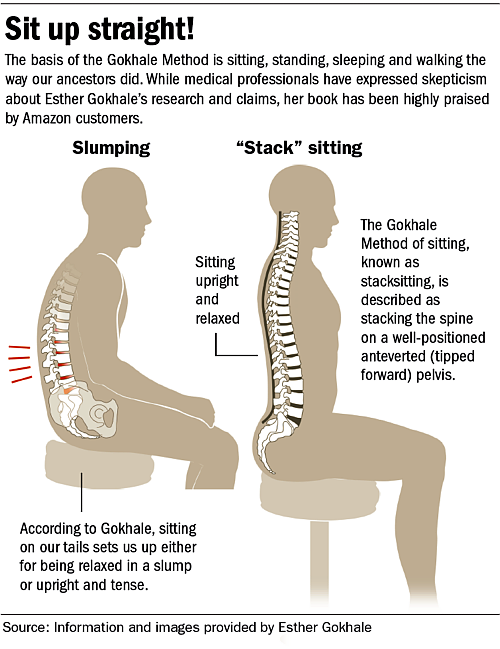 Adding extra length to your spine is easy, Gokhale says. Being careful not to arch your back, take a deep breath in and grow tall. Then maintain that height as you exhale. Repeat: Breathe in, grow even taller and maintain that new height as you exhale. "It takes some effort, but it really strengthens your abdominal muscles," Gokhale says. In many indigenous cultures, people squeeze their gluteus medius muscles every time they take a step. That's one reason they have such shapely buttocks muscles that support their lower backs. Gokhale says you can start developing the same type of derrière by tightening the buttocks muscles when you take each step. "The gluteus medius is the one you're after here. It's the one high up on your bum," Gokhale says. "It's the muscle that keeps you perky, at any age." : Instead, add length to your neck by taking a lightweight object, like a bean bag or folded washcloth, and balance it on the top of your crown. Try to push your head against the object. "This will lengthen the back of your neck and allow your chin to angle down — not in an exaggerated way, but in a relaxed manner," Gokhale says. 5. Don't sit up straight! "That's just arching your back and getting you into all sorts of trouble," Gokhale says. Instead do a shoulder roll to open up the chest and take a deep breath to stretch and lengthen the spine.